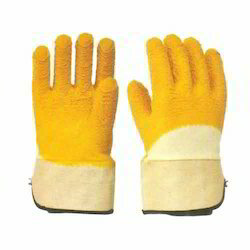 We are indulged offering a broad range of Cotton Supported Latex Coating Gloves, which are available with us in various patterns. Safe to wear, these gloves are designed by using extraordinary grade fabric. These are manufactured from superb quality raw materials using latest manufacturing process and modern tools. Our company has mastered the art in providing Poly Cotton Crinkled Latex Gloves. Flock Lined. 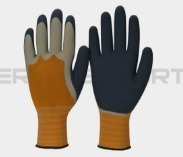 Slip Resistant pattern on palm and fingers. - For hazardous chemical handling, including solvents, thinner, etc.